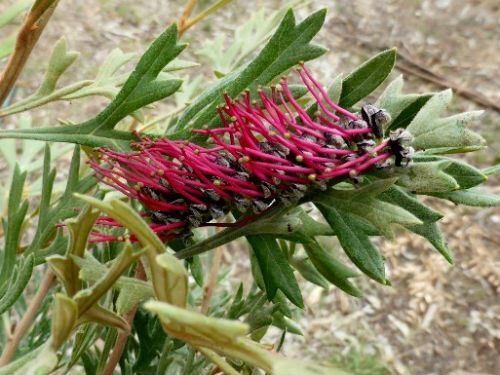 Grevillea beadleana is a beautiful, dense, spreading shrub with soft, divided, grey-green leaves. The toothbrush-shaped flowers are dark red, almost black in colour. Blooms are carried for most of the year and are rich in nectar. Both foliage and flowers are decorative features. A mature specimen will often shelter Grevillea beadleana seedlings under its dense foliage. Grevillea beadleana was first discovered in 1982 and named in 1986. The species is classified as rare because only small populations occur in scattered areas. The original collection was in the Guy Fawkes River National Park, northern NSW. Since then other populations have been found in Oxley Wild Rivers National Park and Torrington State Conservation Area. Both are also in northern NSW. Collections have also been made in the Clarence Valley, inland from Grafton on the North Coast of NSW. Although rare in nature Grevillea beadleana has become available from nurseries. This, coupled with populations protected in conservation areas, should ensure the long term survival of the species. Grevillea beadleana is named after the late Professor N. C. W. Beadle who was the foundation head of the Botany Department at the University of New England (UNE), Australia. He is also remembered by the naming of the NCW Beadle Herbarium at UNE. Grevillea beadleana propagates readily from cuttings.